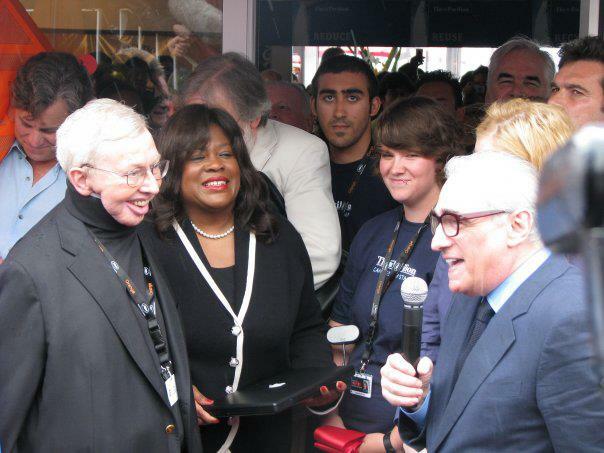 This is a picture of my friend Emma with Roger Ebert, Chaz Ebert, and Martin Scorsese at the 2009 Cannes Film Festival. She held Ebert’s laptop for him during a dedication ceremony. I will never be in a picture this cool. It is not in my nature to get reflective when someone famous dies. Death is part of life and if you’re fortunate enough, you will leave a good legacy behind. That’s how it works. But my reaction to Roger Ebert’s passing has been completely different. When my friend texted me about his death on Thursday, I was stunned. Not by his actual death; I knew that was imminent. I stunned because I can’t imagine processing a movie without Ebert’s reviews acting as a guide and creating a discourse about cinema. No single person has influenced my interest in film more than Roger Ebert. With every step I have taken in my efforts to learn everything I possibly can about cinema, Roger Ebert has always there and it is strange to think that from this point forward, he no longer will be. Like so many others, Roger Ebert and Gene Siskel introduced me to film; At The Movies made film accessible and easy to understand. Although I didn’t realize it at the time, I was in the beginning stages of what became a voracious and steadfast love of cinema. I was 10 when Siskel died in 1999; his death was one of the first times I recognized that a notable person’s passed. Movies became an escape for me when I was a teenager. Without formal exposures to cinema, I would spend countless hours gathering every bit of knowledge about classic cinema I could from Turner Classic Movies. If I wanted to escape to the local movie theater, I would always seek out Ebert’s reviews beforehand and these reviews would always point me in the direction of even more movies to watch. Beyond film, Ebert helped me see the real value and purpose social media can serve in a person’s life. On one hand Ebert merely adapted as the landscape for film criticism and journalism changed, using his Twitter feed and blog to bring his insights to a wider audience. But at a more basic level, Ebert depended Twitter to communicate with others. It is through social media that I interacted with Ebert most after I completed my formal film studies. Last summer something exciting happened. I posted a link on Twitter. It wasn’t a link to something I wrote and from a social media perspective, my original tweet was poorly composed. But whatever. Ebert reposted the link and he typed my name. That was more than enough to send me into a tizzy for several hours. If I was never destined to have an actual interaction with Ebert, this is a good second best option. Reading Ebert’s reviews and essays are great but this tweet means more because of the value Ebert placed on Twitter, social media and the internet after he lost the ability to speak. It wasn’t until Ebert wrote explicitly about Twitter on his blog that I finally saw the value in social media when it is used right and creatively. This all brings me back to where I am right now. (Currently, I’m sitting on my couch watching Some Like It Hot for the umpteenth time.) Convinced I would end up writing about the arts for a major publication or blog, I pursued a career in journalism immediately after my college graduation. But life happens and plans don’t work out. I have ended up on a completely unexpected path and at the moment, I would barely even consider myself a blogger. It has taken me a while to accept that what I always thought I would do is not what I will do. I still write on this blog occasionally because after 8 years it is very much an extension of myself. It provides me with a necessary outlet and most importantly, I have no obligation to anyone except myself. Oddly enough it took reading Ebert’s reflections on his life and his experiences with cinema in Life Itself to help me feel comfortable with the direction my own life is headed in at the moment. More so than any Buzzfeed or Thought Catalog blog post about being in your twenties ever has. It has helped me accept that everything works out for a reason and for that (for all of it) I owe more to Roger Ebert than he will ever know.